I always recommend a mung soup fast along with light vegetables for a few days or a week at the beginning of spring. This helps to detoxify the colon, liver, kidneys. 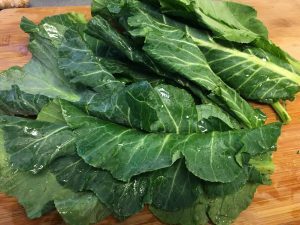 Cooked greens of any kind are a great side dish to support a spring detox, and today I’d like to generate some enthusiasm for collard greens. 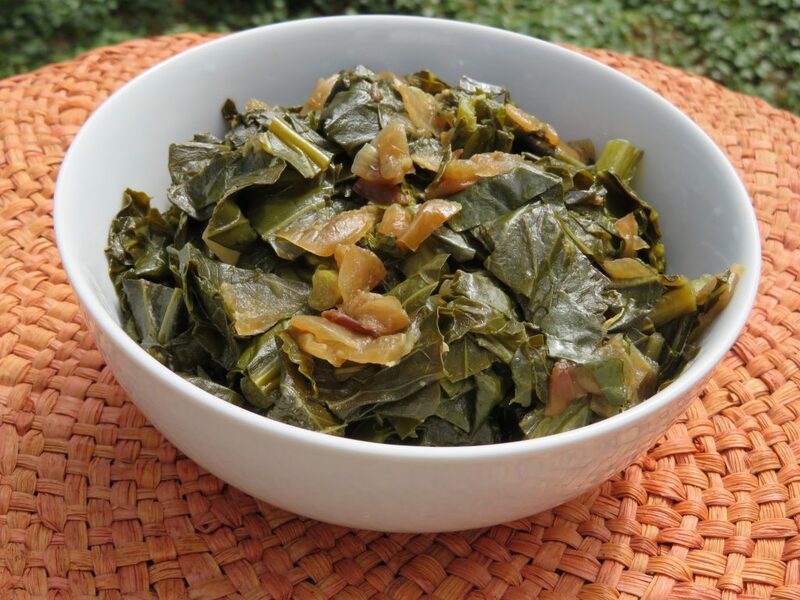 Collards belong to the dignified family of Southern “soul food,” brought to us by African cooks. Although theirs is a sad history indeed, their contributions to Southern cuisine were lasting and impressive. Please allow me to disabuse my omnivorous friends of the idea that collards are only tasty with bacon fat or ham. Pork is not required! Caramelized onions and an exquisite smoky salt are all it takes for this vegan or vegetarian version to rival any Southern comfort food. “The hottest thing in soul food right now is vegan soul food,” said Adrian E. Miller, author of Soul Food: The Surprising Story of an American Cuisine, One Plate at a Time, in an interview at Epicurious.com. With homage to this healthy trend, I add to this dish my favorite Ayurvedic spice combo—cumin and coriander, along with (if you like) a pinch of cayenne—to take this traditional dish of collards to new heights! I’m pleased that this recipe contains all six tastes that Ayurveda recommends for inclusion in each meal. The collards are bitter and slightly astringent. The onions, once caramelized, are sweet, and I add a bit of maple syrup for a bit of sweet elegance. Cumin is pungent. Coriander is sweet and astringent. Ginger is pungent, and if you add some cayenne to the dish you get an extra dash of pungent. There is, of course, salt for salty. Finish these Smoky Collard Greens with a drizzle of balsamic vinegar, and sour completes the six tastes. Enjoy this Ayurvedic take on an old Southern dish! Time-Saver: Caramelize the onions with fat in a separate pan while you start steaming the chopped collards in a soup pot with the water. Combine the collards with the onions and spices once the onions have browned. 1. Heat a very large frying pan or soup pot (with a lid) on medium heat. Dice the onion. Melt the oil in the pan and add the diced onion. Cook uncovered, stirring often, for about 10 minutes until the onion turns golden. Reduce heat to medium low, and cook another 15 to 20 minutes or so until the onion browns and caramelizes. 2. While the onion is browning, wash and drain the collards. Stack several leaves at a time on a cutting board, and cut off the tips of the stems. Starting at the leafy end of the pile, slice 1-inch strips; then chop the strips into bite-sized squares. 3. When the onions are fully caramelized, add the cumin, coriander, and salt and stir. Add the collard greens and water, and stir to mix. Increase the heat to medium for about 5 minutes until the water is bubbling. Cover and cook another 30 minutes or until the collards are completely tender but not cooked to death! Check the water level often, as the collard will absorb most of the water. Add more, if necessary, to keep the collards from sticking. Once the greens are tender, add the ground ginger, maple syrup, and more salt to taste. If you wish, drizzle with balsamic vinegar before serving.